Super Eagles coach, Gernot Rohr said he would love to see new comer Paul Onuachu display his physical prowess against Seychelles in Friday's Africa Cup of Nations qualifier in Asaba. "We have possibilities to see everybody because we have two games. 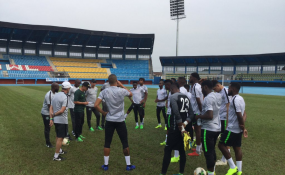 We will see a lot of players," Rohr said yesterday. "And Paul Onuachu will play at least 45 minutes also or even more. We are searching for a player in his profile; tall, he is more than two meters high, good with the head. "We have [Odion] Ighalo already and we are very satisfied with what he is doing since the World Cup but with Paul Onuachu, perhaps, it's another possibility to find a different profile. It could be interesting to see him playing together with Ahmed Musa, Alex Iwobi, Henry Onyekuru, and Moses Simon."